Though not a fan of tattoos in general, I was starting to come around to accepting the fact that many young (and not so young) Jews are permanently inking themselves in the name of Jewish pride. But I have my limits. The main reason I am opposed to Jews tattooing themselves is because the Nazis tattooed us against our will, as a means of dehumanizing us. I realize that Jews today get tattoos davka for this reason – as a way of using something that was meant to dehumanize us as a way of empowering ourselves. It’s that irony that hipsters thrive on. So, if someone wants to permanently mark their skin with Hebrew words or Jewish symbols – gey gezunterheyt. But I draw the line at tattooing your arm exactly in the way that the Nazis tattooed Jews’ arms in the camps…which is exactly what a young Israeli man and his uncle did, supposedly as a way of honoring and connecting with their grandmother and mother who is a survivor of Auschwitz. I am not this young man’s grandmother, but I can tell you that if I were, I would be far from pleased to see my grandson branded with my Auschwitz number. I can think of many other (less shockingly offensive) ways for him to make his savta proud. And if he is so keen on keeping his grandmother with him everywhere he goes, may I suggest his wearing a chain with a locket with her picture inside it? Or maybe one of those charms imprinted with a photograph? Better yet, he could simply savor every moment he still has with his beloved grandmother, and then keep her alive by remembering her and telling his children about her after she is gone. 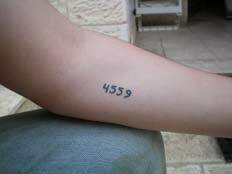 Update: This post inspired Leah Berkenwald of the Jewish Women’s Archive to write her own thoughtful, well-crafted and very personal reflection on Holocaust remembrance tattoos. Click here to read her post, titled “The Loaded Tattoo,” on the JWA blog, Jewesses With Attitude. This entry was posted on April 18, 2010 at 11:12 am and is filed under Israel: Jews In A State, Oy Vey, The Jewish Past, Present and Future. You can follow any responses to this entry through the RSS 2.0 feed. You can skip to the end and leave a response. Pinging is currently not allowed. thank you for sharing this. i *literally* don’t know what to say (quite unusual for me, actually). but i had no idea that people would even consider doing this, much less their reasons behind it. food for thought, indeed. *did* the newsclip say what the savta thought?! First – I realized a read the Hebrew article too quickly and understood that I made a mistake in saying that the young man and his father both got the tattoo. It was the young man’s uncle, not father, who also got it. According to the article, the uncle (who lives in Canada now) came up with the idea and then he and his nephew went together to a tattoo artist in Israel to get it done. The uncle showed his mother what he did and she was angry. She does not yet know that her grandson has also gotten the tattoo – the family decided not to tell her so she would not be further angered. Well, looks like she probably knows now, since the story was splashed all over Channel 2 news! The two men insist that what they did was the best possible way to show solidarity with and love for their mother/grandmother. The only reason I haven’t done so is because I know that my grandfather would never speak to me again, and my grandmother would roll over in her grave. I think I might write some more about this to attempt to explain why I feel drawn to this type of tattoo – and maybe I can help explain why these Israeli men did what they did. Leah – as much as I am not a fan of tattoos in general, I could deal with someone getting a tattoo with “Yizkor” (remember), or something along those lines, on the inside of their forearm. In many ways, that would be very moving. What I cannot condone in any way is getting tattooed with numbers on the inside of your forearm, which is a symbol of dehumanization. Yes, I definitely agree with the dehumanization factor. I’m really glad you wrote about this because it gave me an opportunity to really examine my own feelings about this and get them down on, er, paper. I’m a grandmother with a tattoo (and a blog that’s about Torah, truth & tattoos), but If one of my grandsons came to me like this, I’m not sure how I’d feel. Full disclosure: I am not a survivor or child of a survivor, so this is something of an intellectual exercise. On the one hand, I suspect I’d be horrified that my flesh & blood would want to take on the emotional horror of my experience. On the other hand, that they identified with my pain and wanted to honor it — well, I suspect there would be an element of kvelling there. 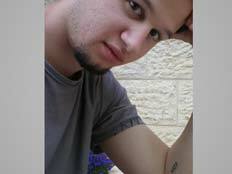 Here’s another case that you might want to check out, where the parent/survivor agreed to a tattooed number: http://www.haaretz.com/hasen/spages/979508.html. Check it out. Sue, thank you so much for your thoughtful comment. And thank you for including the link to the similar story from Ha’aretz from a couple of years ago – I had not seen it and found it very interesting.